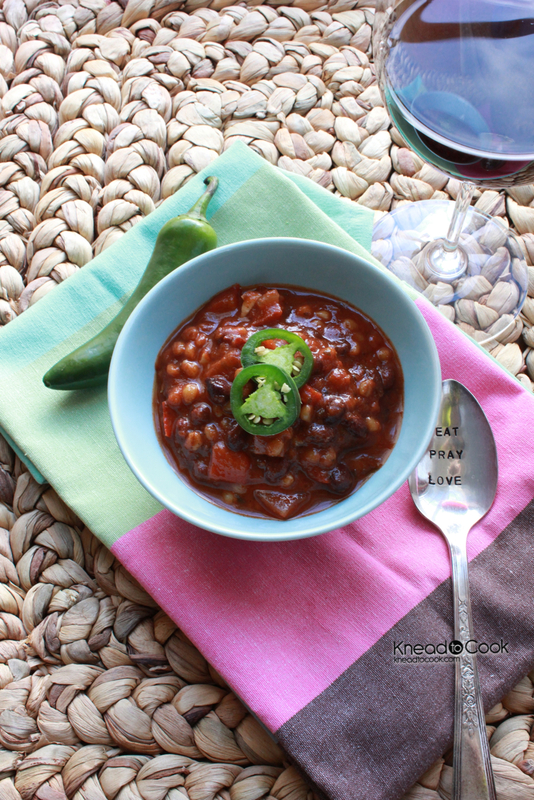 Red Wheat Berry Vegetarian Chili. I found this recipe years ago and saved it. When I was in Vermont a few weeks ago, King Arthur Flour had awesome red wheat berries so I bought them. When they were delivered, I knew exactly what recipe I wanted to try them out on. This recipe was originally in Eating Well magazine or their cookbook, again, it was years ago. I made some adaptations to it and it smells phenomenal. Can’t wait for dinner! My father, a big carnivore, loved it and never noticed the meal was sans meat! LOVE that! Heat oil in a Dutch oven over medium-high heat. Add onion, bell pepper, garlic, chili powder, smoked paprika, cumin, oregano, salt and pepper, and cook, stirring occasionally, until tender, about 4-6 minutes. Add beans, tomatoes, broth and brown sugar. Bring to a boil over high heat, reduce heat, cover, and simmer for 25 minutes. Stir in cooked wheat berries and heat through, about 5 minutes more. (If using frozen wheat berries, cook until thoroughly heated.) Remove from the heat. Stir in lime juice. Garnish each bowl with avocado and cilantro.